At least a decade has passed since North Korea’s official media began urging its people to quit smoking ahead of 2012, the year it aims to become a “great, prosperous and powerful nation,” but recent reports suggest the smoking rate among North Koreans remains high. 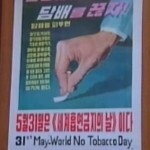 In a report marking World No Tobacco Day, which falls on May 31, Pyongyang’s official Korean Central Television reported Tuesday on the government’s anti-smoking campaign without mentioning its stated aim of lowering the smoking rate to 30 percent by 2010. According to earlier North Korean media reports, 54.7 percent of the population smoked in 2008. The North Korean regime, however, has been persistent in its efforts to reach its goal, enacting a law in 2005 to restrict smoking and banning advertisements in public places that relate to smoking. 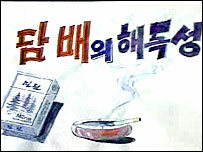 These actions came after Korean Central Television made a broadcast in June 2000 that called on the North Korean people to give up smoking and contribute with their healthy bodies to building a “great, prosperous and powerful nation.” The year 2012 marks the centenary of the birth of North Korea’s late founder, Kim Il-sung. 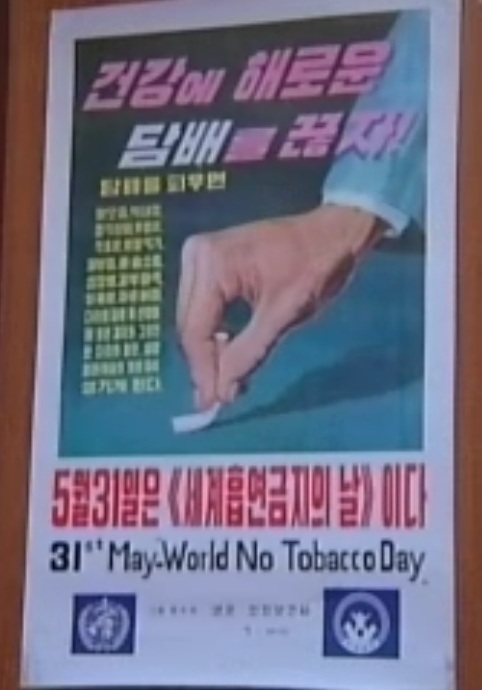 Here is the previous KCNA coverage of “World No Tobacco Day”: 2003, 2004, 2005, 2006-A, 2006-B, 2007, 2008, 2009-A, 2009-B, 2010, 2011-A, 2011-B. The DPRK has a tobacco factory in Pyongyang, Hoeryong and commissioned a tobacco JV company in 2008. This entry was posted on Tuesday, May 31st, 2011 at 7:57 pm and is filed under Light Industry, Manufacturing, Tobacco. You can follow any responses to this entry through the RSS 2.0 feed. Both comments and pings are currently closed.